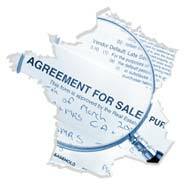 We are a dedicated firm dealing exclusively with French property law, legally qualified both sides of the channel we offer independent bilingual, bi cultural legal advice tailored to your needs. Our comprehensive service provides in depth written reports at every stage of your transaction and delivers the highest level of specialist expertise. We aim to provide efficient solutions to both potential difficulty and new opportunity alike. For further illustration of what we do for clients in the various areas of specialty please visit ‘our services’ & ‘The French legal process’, alternatively click on the appropriate link below or simply speak to us, without obligation, on the adjacent telephone numbers about any of your French legal requirements. Whether it is the purchase or sale of your French home, your holiday residence, a new build project, a leaseback investment or business enterprise, French legal procedure is significantly different from that in the U K and Eire and there are many cautionary tales to be told as witnessed by newspaper article and television program alike. Whatever the nature of your intended transaction we are here to ensure the protection of your interests and provide you with an individual service.